Commercial dumpsters & containers are available in multiple sizes catered to your needs. Click here to view our commercial options. As your hometown hauler, proudly serving Newtown, Sandy Hook, Southbury, Oxford, and Bethel, we have separated ourselves from the others through our extraordinary, above and beyond personal service. “We supply the “Trash Cans” as part of our service. Our roll out trash carts range in sizes of 32/35, 65, and 96 gallons. If your cart is damaged, we will fix or replace the cart at no additional charge to you. When you call us, you’re calling your neighbor just down the street! We are confident that you will never find a better service. We also provide driveway service using small collection vehicles. 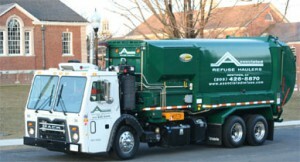 Associated Refuse has a variety of cleanup containers available in 4, 6, 10, 12/15, 20 and 30 cu. yds.